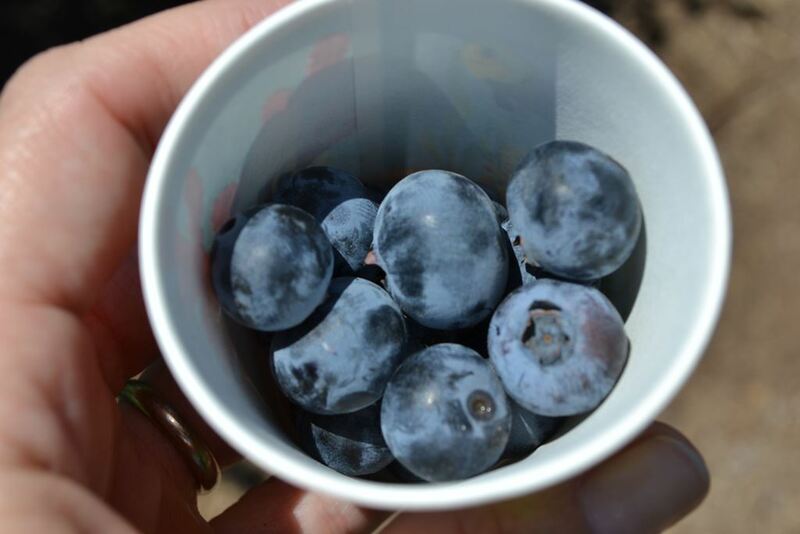 Did you open up a plastic clamshell of blueberries to serve at your most recent picnic? If you’re like most families, you probably polished off two or three containers’ worth before the kids had their fill. So how do those blueberries actually make it from the plant to the package? We took a Real Food Summer road trip to Berry Lady Farms in Kingsburg, CA (along with friends from the California Farm Water Coalition) to find out. Berry Lady Farms is a part of the fertile farming region of California’s San Joaquin Valley known as the Fresno Fruit Trail. Berry Lady is a small family farm that grows several varieties of blueberries, along with blackberries and a special boysenberry breed known as Ruby Boysens. Proprietor Gayle Willems loves giving visitors a history lesson about blueberries: Blueberries are one of only three fruits that are native to North America (along with cranberries and Concord grapes). The blueberry plant is a perennial shrub that can grow up to 6 to 7 feet tall. If it is properly cared for, it can continue to produce fruit for up to 40 to 50 years. A healthy plant has the potential of producing an amazing 300 pounds of fruit in a lifetime. 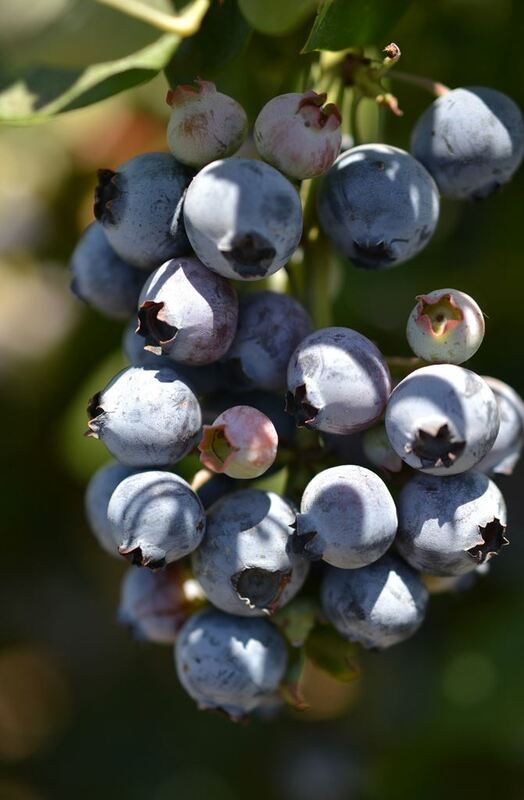 And sure, they’re tasty, but the berries are also among the best foods you can eat: They are higher than any other fruit or vegetable in antioxidents; plus they are a great source of fiber and Vitamin C.
The blueberry picking season lasts from mid-May to early July. (When we were at the farm, we saw the last few days of what had been a very busy season.) 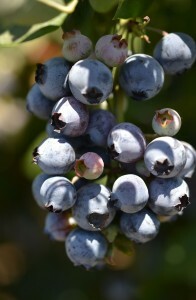 The blueberries grow in clusters and they are easy to just pop off the vine by hand (no thorns, no prickles). However, blueberry picking is an extremely labor-intensive process. 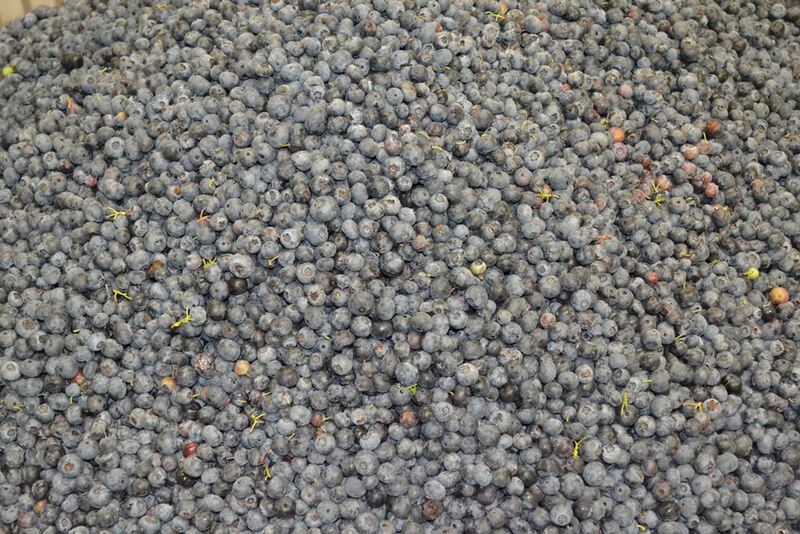 On the Willems’ 100-acre farm, it takes 1,000 people to pick the berries over the eight-week harvest period. 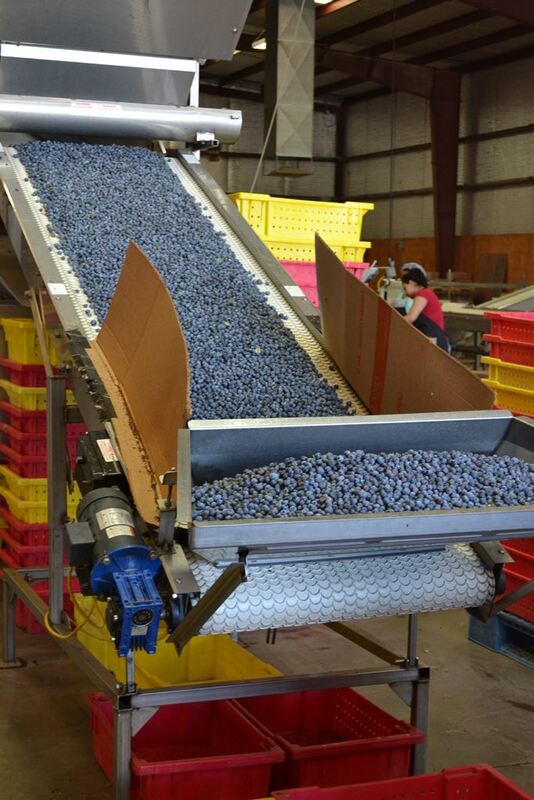 After the blueberries are picked in the fields, they are hauled just steps away from the field into the packing warehouse. 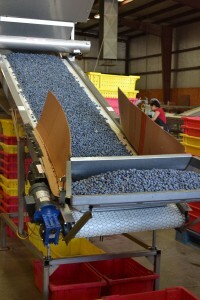 The blueberries get dumped onto a long conveyor belt, where they go through multiple sorting processes. A specialized machine first pulls out any rocks, leaves, or tiny berries, as well as red or green berries. 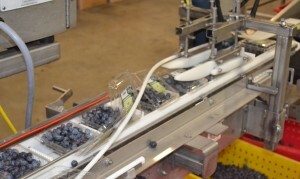 Next the machine scans the berries and pulls out the ones that are too soft. Finally the berries roll past a team of expert blueberry workers, who then do a visual sort to remove any stray or odd berries. What happens to the red, green, and/or mushy berries that get pulled out of line? 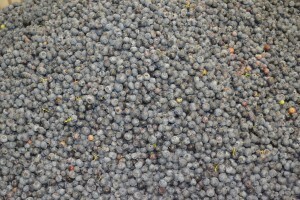 There’s no waste here: They get mashed and sold for concentrate, juices, baby food, and other blueberry-related products. The remaining berries then continue their ride up the conveyor belt and into special sorting chutes, where they are carefully weighed and dumped into clamshells (made from recycled soda bottles). There’s no time wasted here, either: The computerized weight filler can process between 160 and 170 cups of blueberries per minute. 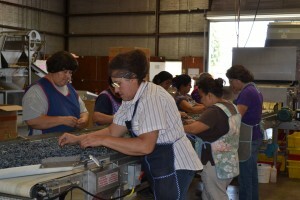 At the final step in the process, a machine snaps the clamshell shut, and then workers pack the clamshells into boxes where they go on to the store. 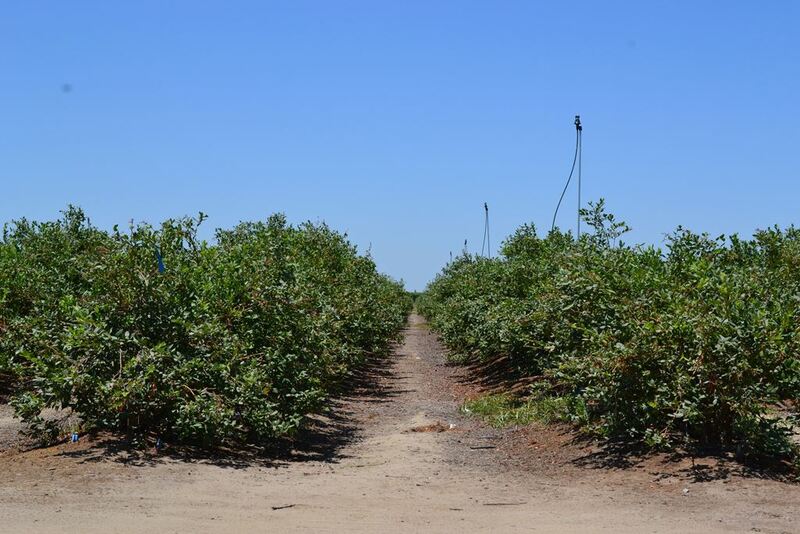 Berry Lady Farms grows 12 different different varieties of blueberries. During our visit, we had a chance to pick and sample the Emerald, Star, and Legacy varieties. We also got to see the tail end of the Larryberry crop (a special breed named for Gayle’s father). The Larryberries are huge – almost as big as a quarter – and were an instant hit with our kids. We had a contest to see who could find the biggest remaining Larryberry, which sent the kids scurrying off in every which direction to find the winning berry. Hungry for blueberries yet? One last thing to remember – blueberries are packed and shipped as soon as possible to keep them fresh, and they are not washed beforehand, so don’t forget to wash them before you eat them at home. Many thanks again to the California Farm Water Coalition and the Fresno County Farm Bureau for sponsoring and facilitating our trip. Stay tuned for more Real Food stories later this week with a visit to two stone fruit farms and a tour of an olive oil production facility. Just wanted you to know how much I enjoyed your visit to Berry Lady Farms on Saturday. I wondered why you were taking so many notes. But now that I have read your blog, I understand more about why you were asking so many questions about the farm to fork experience of blueberries. Keep up the good work! Today’s blog was the most comprehensive and informative article that anyone has ever written about our farm. Please come back again during the peak of our season in June, and I will be able to spend more time doing real taste testing with you. P.S. 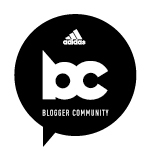 With your permission, I would like to add you as a link on my website. Wonderful! Thanks for making me really feel bad for missing out on this tour. 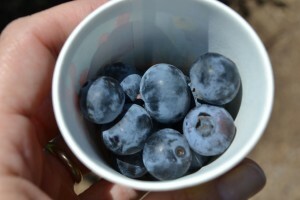 We have our small blueberry bush in the yard and the kids enjoy walking by and grabbing a couple to snack on. But, it’s never enough to satisfy our blueberry cravings! I would have loved to have been apart of this =) I love tours, but tours related to fruit, heck yes. Blueberries are so good. What a great post Jeanne! I had some ruby boysens for breakfast and had to stop myself from eating the whole container in one sitting! Looking forward to reading your next posts on the rest of the tour. thanks again to the Berry Lady for giving me my first taste of a blueberry, it certainly won’t be my last. 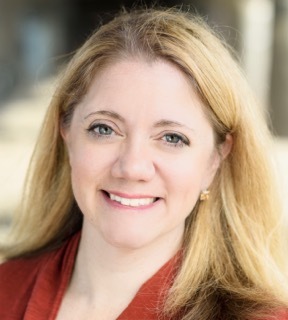 Great Post Jeanne! Just wanted you to know that because of a problem with Yahoo, we are changing our email to…berryladyfarmstore.@gmail.com. We love to receive your articles and hope you will come to the farm again. Gayle, Berry Lady Farms in Kingsburg, Ca. OK – Thanks for the heads up, Gayle!